Tokoriki Island Resort is a highly ranked favorite of couples to Fiji and it’s easy to see why. The contemporary-styled resort meshed with traditional Fijian design is situated amongst tropical paradise in the Mamanucas. Their Fijian hospitality is top notch, catering to every guest need quickly and with a smile on their face. There is plenty to do from snorkeling to a spa day… or do nothing but relax on a private beach, if desired. And the accommodations, especially for the couple seeking romance and a trip of a lifetime, are just outstanding. The adult-only resort has 36 freestanding beachfront bures. There are three different accommodations to choose from – the Beachfront Bure, the Beachfront Pool Bure, and Sunset Pool Villa. The bures are Fijian designed, air conditioned, and feature indoor and outdoor showers. The Sunset Pool Villas are a special added luxury as they have a separate living area, larger deck, infinity edge personal pool, cabana, and double daybed. And if you stay in the Sunset Pool Villa, you will also receive complimentary daily canapes and laundry service. Meal options and menus at Tokoriki change daily for lunch and dinner. 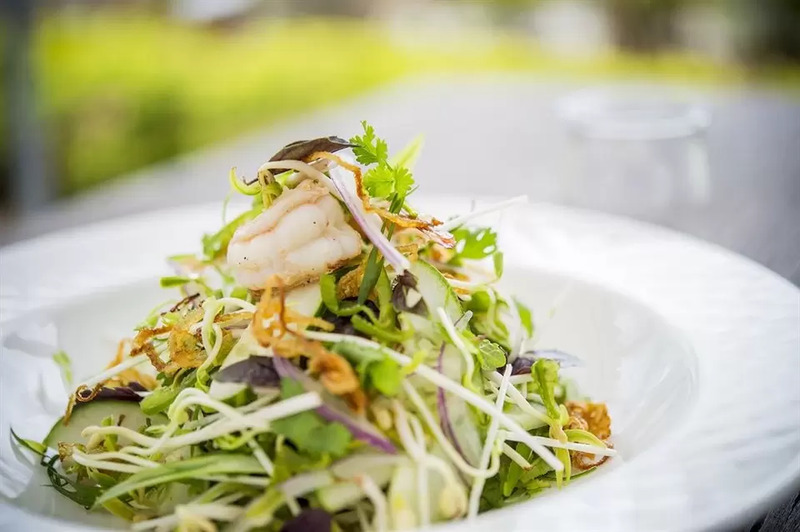 The menus feature local and imported produce and South Pacific and Asian influences with an international twist. Guests can enjoy the breakfast buffet (or order from the menu) with free flowing French sparkling wine on the oceanfront deck for breakfast! For lunch, a two-course a la carte meal can be prepared. Dinners include a three-course meal and on Wednesdays, take part in a special traditional Fijian lovo ‘Taste of Fiji’ buffet. 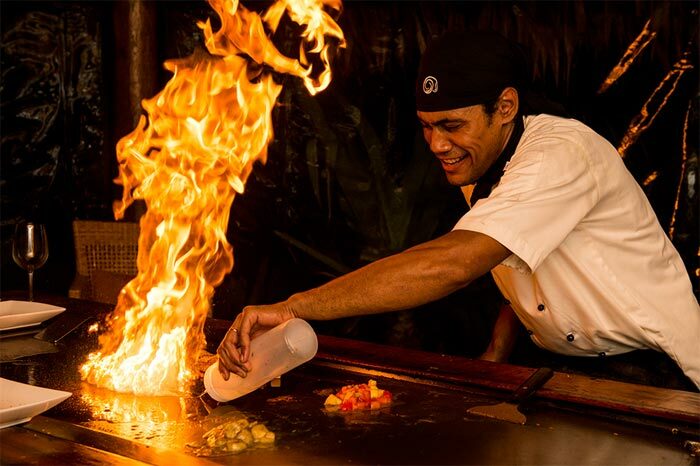 For a unique dinner in Fiji, try the Japanese Teppanyaki-style dinner. 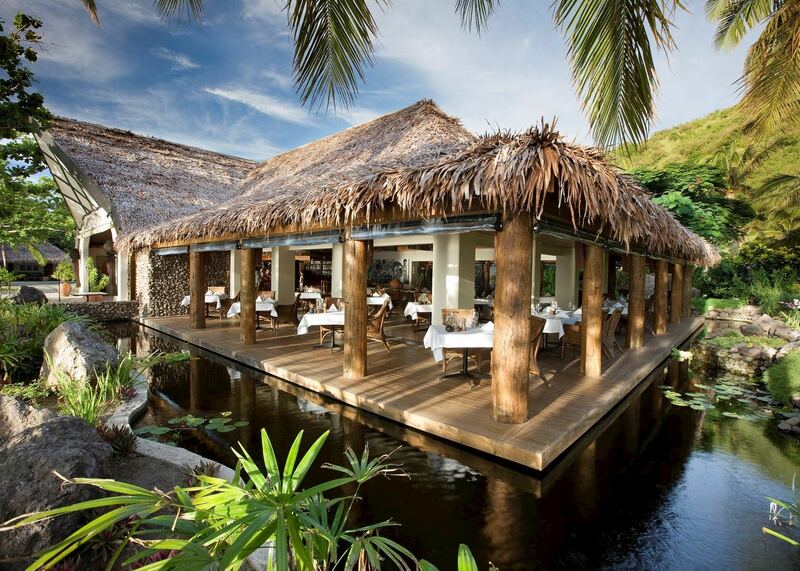 Guests can book a meal prepared in front of them in a traditional Fijian bure. The dining experience comes complete with watching the chef’s knife and cooking skills before enjoying the meal. The activities in Fiji paradise at Tokoriki are endless, depending on how much relaxing versus adventure you want to do. All non-motorized sports are included in the stay. So, you can do stand-up paddle boarding, hobie cat sailing, windsurfing, snorkeling, and kayaking all complimentary. Other things to do around the resort include using the lovely fresh water pool, basket weaving, the coconut show, glass bottom boat trips, herbal medicine walk, hiking, jogging, table tennis, chapel service, soccer, volleyball, crab races, and taking part in a traditional kava ceremony. Our Fiji Vacations team can help you decide on the additional activities off the resort as well like a guided snorkel safari on two offshore reefs with coral, sea turtles, and reef sharks. A marine guide will take you to the best snorkel spots and point out interesting aquatic life. There’s also island hopping with a visit to Cloud9 for lunch, a day trip to the local village, and a visit to Monuriki made famous by the Tom Hanks movie. If relaxing on a private island is your dream, you can escape to a secluded island and relax for half of a day (with a picnic lunch and a bottle of French sparkling wine!). 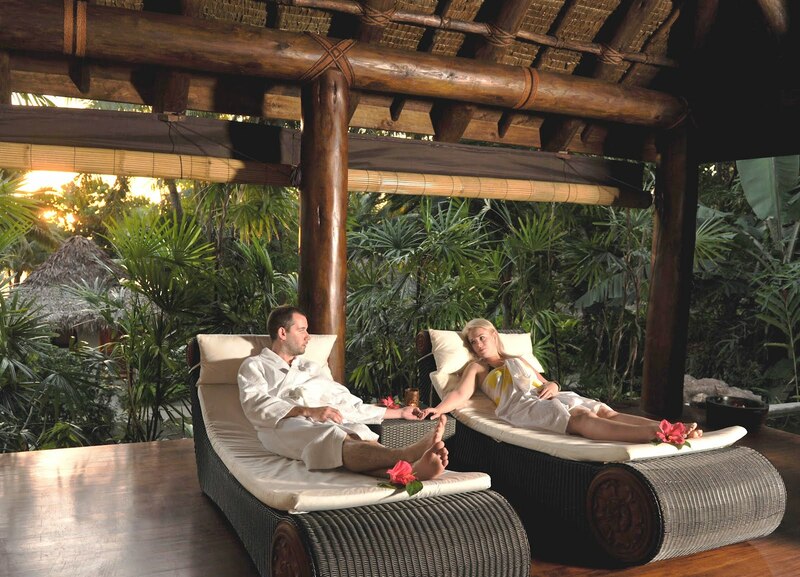 Enjoy endless romance on Monu Island, about 15 minutes away from the resort. To truly unwind, you’ll want to check out Tokoriki’s spa retreat. They have individual couples’ treatment bures with gentle falling water over freestanding volcanic rock walls to soothe. Book the unlimited spa package and enjoy three, four or five days with their hand, head, neck, scalp, foot or body massage package by professionally certified therapists. There’s also a special couples’ treatment at sunrise or check out the In-Villa Indulgence with an in-room massage and a Moet & Chandon dinner in the villa. Tokoriki Island Resort is situated in the Mamanuca Island Group, just off the west coast of Viti Levu. It’s just a short 12-minute helicopter or seaplane ride and a one-hour ride by speedboat or catamaran from Nadi.